Recruit team members and gain experience before adventuring through the world. You are the lowly tinker (the Excuse). A strange wizard has charged you, the Sailor, the Soldier, and a Spy (the Diplomat) with defeating an evil that has taken over the world. He gave you 36 magic amulets (suit chips) for your journey. Your company of four will recruit new members and master events before leaving on your adventure ridding each location of evil. In the beginning your hand/draw pile consists solely of the Excuse, the Sailor, the Soldier, and the Diplomat. All other personalities (11 cards) go into the personality pile. The event cards (including the Market, 11 cards) go into an event pile next to the personality pile. The Aces are placed in their own pile. The remaining cards are all location cards (including the Origin and the End) and go into a location pile. Draw the top personality card and the top event card. Look at them and then decide which one your group needs more and trash the other, it's now out of the game forever. The chosen card is now the challenge card. You defeat the evil spells cast on the personalities or gain knowledge by mastering an event by having the sum of your played cards and suit chips be equal or higher than the chosen card. Place the chosen card face up in the challenger position. You can choose to quit fighting and trash the challenge card at any time after your first card is played thus not gaining a team member or knowledge. You get one "free" mandatory play. Each play after that costs one suit chip, but the suit chip counts toward your sum for that suit. If you play a suit chip you must play a card. When you've beaten the challenge card you add it to you discard pile. When you've gone through your hand, add an Ace to your discard pile, reshuffle, and work your way through your deck. Every time you reshuffle, you must add an Ace to you hand (this represents your group's additional weariness from adventuring). When you've worked through the personality and event piles move on to round two. Work your way through the locations of the world the same way you beat the challengers. You must defeat evil in every location to win, you cannot lose a challenge against a place. Locations are not added to your your hand after you defeat the evil magic there, you just move on to the next location. Continue to add an Ace every time you go through your hand, until they run out. The game ends when you can no longer play (out of suit chips, but need to draw more cards to remove evil magic from location) or when you've made it successfully through each location (thus removing evil from the whole world). Note: In the image above, the player drew the Merchant and an event card. The player looked at both cards and decided to play against the merchant. The player took the top card off his hand pile and put it (the Savage 3 ) into play (this was a mandatory play). The Savage's 3 count towards the goal (the Merchants 9 ). The player decided to continue trying to relieve the Merchant from his evil curse, so he played 1 suit chip which allows him to draw another card and brings his sum up to 4. 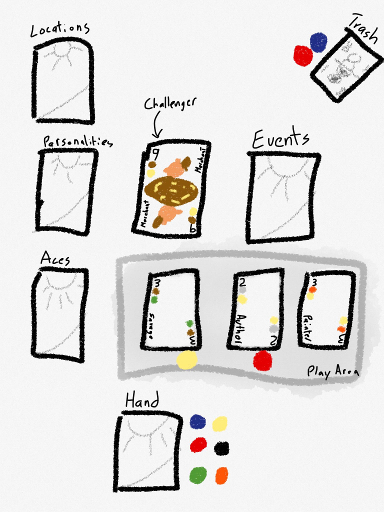 The player draws the next card from his hand and he puts it into play. This time it is the Author 2 . This brings the player's points up to 6 total (the Savage's 3 + the 1 suit chip + the Author's 2 ) which is still not enough to remove the curse. The player decides to play one suit chip (bringing his total to 7) and draws from his hand. He draws the Painter 3 bringing his total to 10. He has removed the evil curse from the Merchant. He trashes the two suit chips he played that turn (they never return to the game), he takes the Merchant, the Savage, the Author, and the Painter and places them in a face up pile next to his hand. When his hand runs out, he shuffles an ace into the stack, and it becomes his hand. Pawns are valued at 10, Courts 11, and Crowns are 12. Aces are worth 1 and the Excuse represents you (worth zero). Lose one additional chip of your choosing when you lose a fight. Inspired by the solo adventure Friedemann Friese's Friday. In Setup I don't see where the hand goes. If I got it right, the hand is a face down draw pile. In that case, "hand" is not the most appropriate term. "Merry band" or something like that would fit it better. Also, it might be worth to clarify what happens if the Excuse or an Ace come up, at least in a modified example section. The "hand" is a face down draw pile. I will work on the wording. I will try to add something for the aces and the excuse also. I play with the excuse having 0 points towards the current goal and aces having only 1 point. While Pawns and Courts are versatile, the Crown is rather weak in comparison, as it can be a total dud in a fight, and in itself hard to obtain. At the moment I try to avoid all Crowns in the first round, even if it means forfeiting a fight. This seems to narrow down the strategy for me. Do you feel it might be worthwhile to give the Crown a boost?